Providing ongoing training is the best way business leaders can equip employees with the soft skills they need. A learning management system streamlines training, increasing its effectiveness. Related Reading: Increase Your eLearning ROI with Soft Skills Training. 1. Introduce one soft skill concept at a time -- The single-concept learning model, also known as the ‘thin-slicing’ learning model, calls for each eLearning lesson to introduce just one concept to improve knowledge retention. Consider a typical online soft skills course on communication that includes many concepts. There’s a lot for learners to focus on, and as they move through the lesson they may lose ideas introduced earlier in the course. Training can be more potent when course information is focused on one only concept per learning encounter.7 LMS learning path functionality and content management features enable administrators to distribute training according to the single-concept model. 2. Foster creativity with whiteboards -- LMS whiteboards are an ideal tool for teaching employees to be more creative. They encourage collaboration by enabling workers to expand on each other’s ideas with notes, sketches and diagrams. This can be a welcome change from written communication and can strengthen an employee’s ability to be innovative. 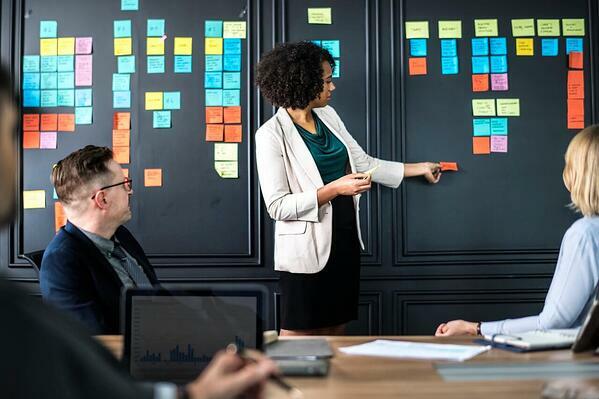 Promote soft skills with social learning tools -- A learning management system’s social learning tools create opportunities for employees to work with one another and develop communication and teamwork skills. Social learning tools facilitate online communities and knowledge sharing, which encourage regular interaction and collaboration. This naturally promotes soft skills. Companies that prioritize soft skills training often experience an increase in productivity, R&D capabilities and workforce collaboration and communication. Organizations that deliver this training through an LMS will have lower training costs, a quicker training process for employees and increased engagement. LinkedIn. Data reveals the most in-demand soft skills among candidates. https://business.linkedin.com/talent-solutions/blog/trends-and-research/2016/most-indemand-soft-skills. Adecco. Lack of soft skills negatively impacts today’s U.S. workforce. https://www.adeccousa.com/about-adecco-staffing/newsroom/press-releases/lack-of-soft-skills-2013/. 4, 8. Soft Skills Bootcamp. Lack of soft skills. https://softskillshq.com/pages/the-lack-of-soft-skills. Christopher Pappas. The to 8 benefits of using learning management systems. https://elearningindustry.com/top-8-benefits-of-using-learning-management-systems. 7. eLearning Industry. Soft skills training: how to make eLearning work for enhancing soft skills training. https://elearningindustry.com/soft-skills-training-make-elearning-work-enhancing-soft-skills.